A lovely lady sent me a message on one of my Facebook pages the other day asking me to interpret a rather disturbing dream for her. She has given me her permission to share her dream and my interpretation on here. I won’t use the lady’s name but I thought it was a good example of how really scary nightmare images can actually be very simple symbols to interpret and help you in your day to day life. I had a dream the other night. Don’t know if you can help me, but I’m always running away from zombies. (okay, so it’s more than just one dream). This weekend I dreamt my brother drove someone over, then shot himself in the head. I watched the whole thing. It felt soooooooooooo, so real. I ran to the car and the blood wasn’t coming from his head but his heart – the wound was there instead. I woke up crying. I couldn’t stop. It felt too real. About two weeks earlier I dreamt I was hiding. I don’t remember all the details but the dream started off calm, then there was an explosion and next there were guys with guns chasing us. We started running and I changed direction because I knew it would not end well. The “runners” ended up hiding in a room. I found a small box and hid in there, thinking it’s the last place they’ll look. A tall black man found me first, shot me twice in the heart and what should have been a lot of blood was a dash (almost nothing). To my surprise I didn’t die. So I pretended to be dead but he found it strange that my eyes were closed, not open-dead. Then my body jerked and gave me away. He shot me again. Each time, I pretended to be dead, but my body jolted and gave me away. And each time he shot me in the chest, almost no blood and at the end I was afraid he’d get tired of it and just kill me with his hands and spread my body parts across the room (that way I wouldn’t be able to come together and be alive). At the end my body jolted and I had a whole lot of water coming out of me. I actually feel a bit more powerful having this dream. Usually I lose a lot of blood (energy), and it feels like whatever it is, it’s not hurting as much. This same night zombies were chasing us in another dream. Anyway, thought you may have a different angle. LOL funnily enough I’ve had a few zombie dreams myself. I am by no means an expert – I’m not a psychologist or anything like that, so I can only offer you my personal view on dream imagery. There can be so many different interpretations to one symbol in a dream – the best person in the end to figure it out is yourself. But here are a few things that may help you work out what your dreams are trying to tell you. Your dreams sound more like nightmares – were they very scary? I would say the first thing I’ve learnt about dreams is that every image is telling us something about ourselves. So don’t be scared – whatever is happening in the dream, it is your unconscious trying to draw your attention to something in your life that may need sorting out or not – depends on the symbolism. Running away from something in a dream usually means you are avoiding something, not dealing with a situation or anxiety perhaps or an aspect of yourself you are afraid to face. Usually it is advisable if you can become more aware in your dream state that you turn and face whatever it is that you are running away from. 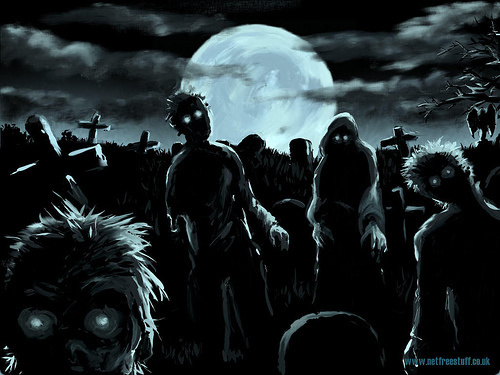 A zombie is by definition ‘the living dead’ – a creature that is only a semblance of life, therefore maybe you are not living your life to the full and feel a little like that zombie – just a semblance of yourself, maybe lacking in energy, just sleepwalking through life. Death can also mean an opportunity for new life – so maybe you are running from a part of your life that is dead and no longer relevant to your life now and you need to leave it behind and get on with living your new life. Now the dreams where you are hiding are very similar, you are avoiding facing up to a situation, perhaps not being honest with yourself about something. The box you are hiding in where you hope nobody will find you is basically of your own making. In life maybe you are limiting yourself – just trying to blend in with everyone else – probably best to break out of the box and expand your vision, don’t impose limits on yourself. Do you feel like a certain situation is boxing you in, trapping you somehow? The pretending to be dead part and keeping your eyes closed is just another way of hiding. The fact that you were surprised you didn’t die shows that you know that it’s ‘not the end of the world’ and you are more powerful than you give yourself credit for. An explosion after a period of calm could mean that something has happened in your life out of the blue that has had a powerful effect on you or that some pent up feelings have been released and need to be dealt with. Guns in dreams usually have a sexual connotation and being shot usually leads to losing energy. If men are chasing you with guns, I wonder if you are avoiding something about relationship issues to do with a man or men in your life. Your choice to change direction could be something to do with a new relationship – maybe you are in a new relationship or there is something about a relationship that needs to be changed. It doesn’t necessarily have to be a love relationship, but I’m guessing it is with a male. However it could be a change in a part of your own relationship with yourself, perhaps a masculine part of you like you are feeling more powerful and in control or you need to be more powerful and in control in your own life. It could also be a change in a spiritual relationship. In the end when you just have water pouring out of you – to me water is emotional energy so a relationship you are in may literally being draining you emotionally. The whole image of the tall black man shooting you in the heart is an interesting one to me. The black man I feel is unconscious, unknown parts of yourself, maybe those strong, male powerful aspects I talked about before, perhaps you have been afraid to show your more powerful, confident, assertive side and it is that aspect of yourself that is trying to take control of the situation or indeed you in your life. Your heart is your emotional centre – losing energy through a wounding could mean someone is draining you emotionally – are you getting caught up in other people’s trips, giving away your power to others by over empathising with them and not concentrating on your own needs? The heart is also the ‘Christ centre’ so it could be a spiritual rather than a relationship crisis. Now to go back to the incident you opened with – your brother running someone over with the car. The car is you – your vehicle through life. The fact that your brother is driving the car makes me feel like, either he has more control over what you do than you yourself or that aspects or strengths that you see in your brother are aspects you need to have in your own life. Running someone over may mean you have hit an obstacle in your life or that someone is in your way – standing in the path of your life’s journey. The shot to the head may mean that you are over thinking a situation or that something is too hard to deal with or think about and it is leading to you losing emotional energy from the heart chakra again – i.e. it is draining you. The fact that you woke up crying, suggests to me that there is something in your waking life that is upsetting you and draining you emotionally that you need to take control of. How was that? Any help? Or was it total drivel? LOL If it has helped in any way can you let me know. Wow. Thank you soooooooooo much for all that help. Your input is so much appreciated. I need time to discern, dissect and categorize everything as I am indeed not facing a lot of things. But not because I don’t want to. Because I am tired. Tired of so much. And hurt. By an old relationship which was so close to being rekindled and now I have to forgive myself for messing it up. So there you are – a real person with a real dream that on the surface appears really scary and overwhelming but when you break it down and look at the images symbolically they can be used to see how your unconscious mind tries to give you clues about what’s going on and how you can deal with different situations in your day to day life.